Airfield Garage Car Show Saturday 8th June 2019, Seckington Cross Winkleigh EX19 8EY We are very excited to be hosting our very own car show this year, it is open to all vehicles, from old vintage to brand new, cars, bikes, trikes, campers, whatever it is you have and would love to show us we can't wait to see it!! We are running a fun competition for the rustiest, the most loved and the shiniest!! This is just for a bit of fun on the day and will also have a short ride around the village!! Sam's cider will be on site offering a range of their gorgeous ciders and Ozzy & Uncles will have the barbi sizzlling offering hot food!! 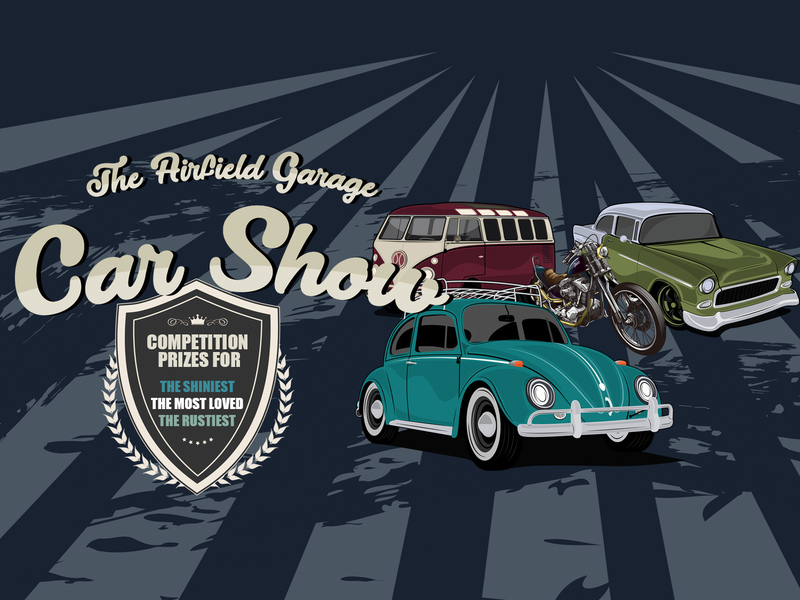 Parking will be marked in the field for visitiors to the show but if you want to show your vehicle you must pre book an entry for it so we can allocate a space, you can do this by email nicky@airfieldgarage.com, messenger or send a message from our contact form. All entries are free and the event is open to everyone. A busy couple of weeks on Nigel’s van (from an old taxi). Bodywork repaired and prepped then a grey undercoat to ensure the paint goes on evenly and without shade differences. Then 3 coats of a Mercedes metallic green base coat followed by 4 coats of clear lacquer, a body kit and a new set of wheels and the transformation is complete. 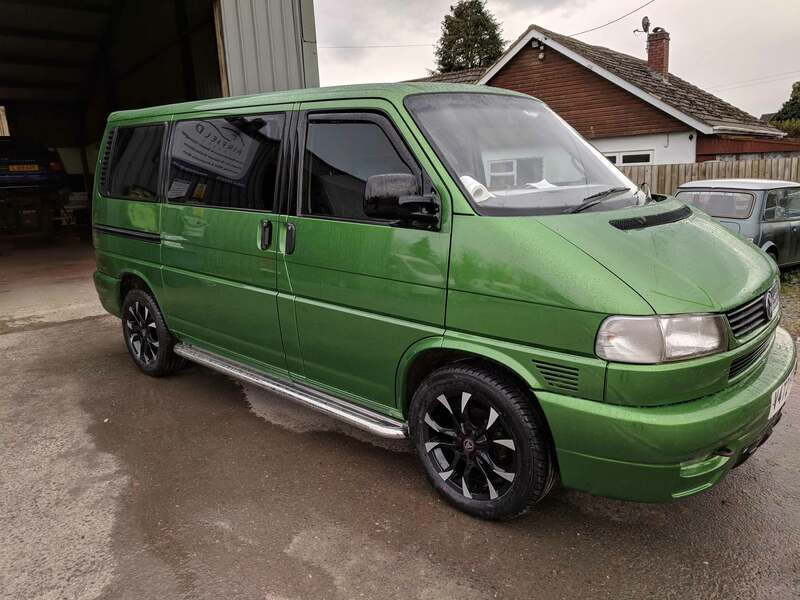 A turbo conversion, alarm, central-locking and electric windows fitted before we unveiled it to the happy customer. So, this will be the new show car... We may need a little help from the family, but as you see we have the man power! 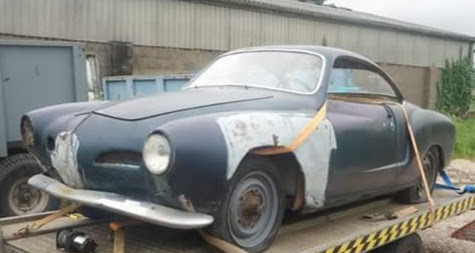 This 1964 Karmann Ghia needs a lot of TLC but, for what we have in store for it, I couldn't warrant finding a complete one. This will be a mild custom job but with major unseen modifications, giving us hopefully a one-in-the-world car. Watch this space for updates as we progress through the year. As with any of these builds, we will have good and bad weeks but I can’t wait to see and drive this car; it’s been a dream for too many years now!!!! Here's a VW beetle restoration we're doing at present. Week one was strip and investigate, lots of work to the bottom 6", so we start with the pans. 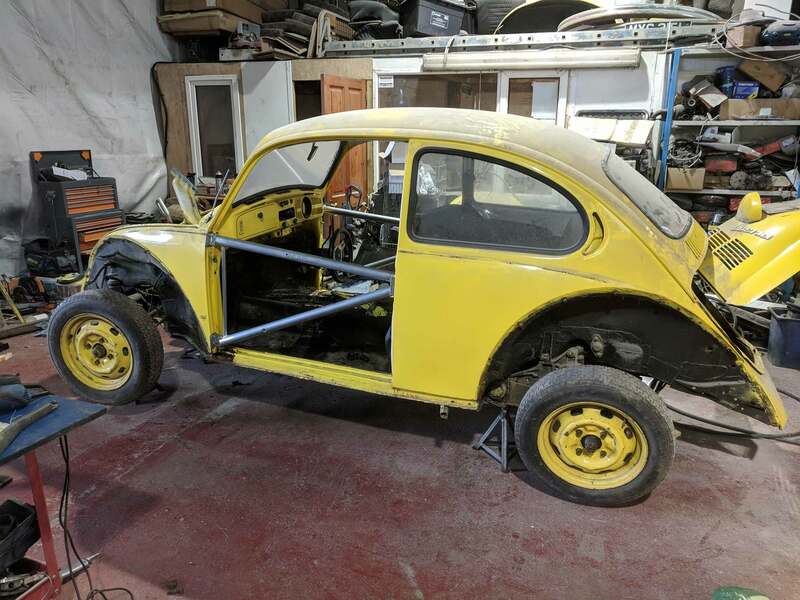 Pete's made some body supports that are bolted to the door A and B pillars and then we un-bolt and cut (as someone has welded the body to the floor) the main body from the chassis. Pete then works his magic on cleaning the main tunnel and cutting off the old floor pans followed by new pans and rust prevention keep watching for further updates!